Organizations are seeing significant change impacting every element of their business. Driven by the exponential development of new technologies, an increasingly connected and globalized business landscape, and the rejection of outdated or ineffective hierarchical organizational structures, the future of work has clearly arrived. To meet the demands of these changes, organizations and teams need to shift their thinking about learning—it can no longer be a once-a-year event, or thought of as something that is “nice to have”—learning must become a cornerstone of organizational culture. This means that the L&D function must undergo a radical shift, from providing content-based solutions to learning initiatives that are integrated into the context of day-to-day operations. Not all consultants are ready to be leaders through this transition. Even if learning and training is only a small part of your client offering, you need to be thinking ahead to holistic solutions that integrate learning into the culture of your client organizations—or risk allowing them to get left behind. We’ve outlined changes to learning in our ongoing “Selling The Future of Work” series (part 1 focused on the increased need for what some call “soft skills”). What continues to be clear is that only making changes to what is learned by teams is insufficient; the how of learning and development must change dramatically as well. And with these changes, consultants must also be evolving their offerings and learning solutions to meet these new demands. We’ve been diving into this topic in recent months, and finding clear evidence for the changing skill requirements within teams, not just in what they need to learn, but moving beyond content to allow for learning solutions that provide opportunities for context. 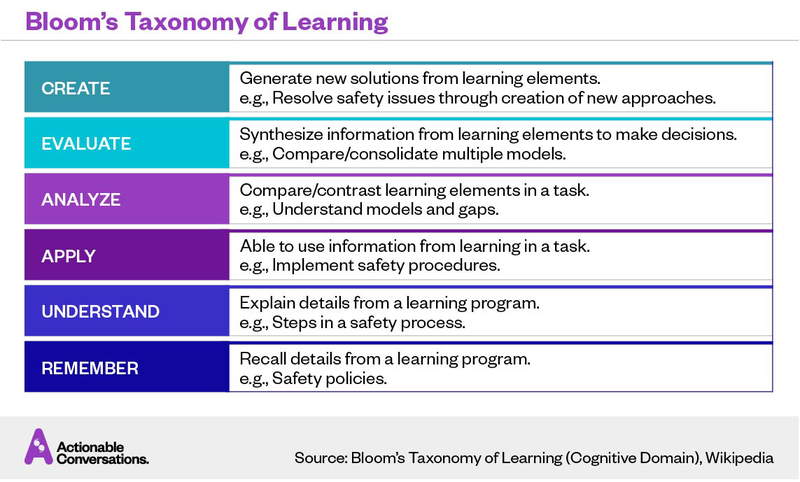 It’s an older model, but Bloom’s Taxonomy of Learning provides us with a backdrop for understanding the different levels of learning that can be provided to teams. It outlines not only the learning outcomes for participants, but also the depth or degree to which the learning can be integrated into the participants’ work. As learners move to the top of Bloom’s model, learning becomes the synthesis of multiple inputs, and allows them to create new solutions to test and implement. The bottom level, “remembering,” is based entirely in content—a learner will memorize the details of a policy. As the learner moves up through the layers, they begin to integrate their knowledge into the context of their teams, ultimately arriving at an integrated position, where they are creating new policies based on their current realities. We’ve used the example of safety policies to demonstrate this model: at the bottom level, individuals learn the content of a policy (all spills must be immediately cleaned up). As they move up, they understand the reason for the policy (to prevent people from slipping), and apply the policy (they clean up spills as soon as they see them). From there, individuals can begin to analyze and synergize what they have learned (they determine that a particular piece of equipment is prone to leaks, or notice that while the team is great at cleaning up spills, they are neglecting to clean their stations at the end of the shift, introducing new safety issues). Finally, the individual is actively engaged in creating new policies that are integrated into the context of their work. As learners move up through the model, they require learning that is more deeply connected to the context of the work environment, and delivered in a way that allows learners to shape the information to meet their unique needs. Unfortunately, the reality is that organizations are relying on traditional learning solutions that take too long to implement. These content focused initiatives simply can’t keep up with changes in the business landscape, often becoming obsolete before individual learners can remember or understand the content—making it nearly impossible to reach the levels of synergizing or creating. In Whiplash, authors Joi Ito and Jeff Howe talk about the critical trends shaping the way work is evolving, where the speed and complexity in organizations today is unparalleled. As I read it, I realized that Learning & Development professionals are facing an increasingly impossible task. Work is changing too quickly. Overnight startups are eating into traditional business models, and teams need to be ready to respond quickly to evolve their work and keep pace. L&D is asked to develop curricula and build program offerings to meet the needs of their workforce, but staying ahead of these requirements is close to impossible, given the rate of change. Picture a company that decides to implement a new customer care eLearning solution. In the time that it takes them to develop the training scenarios and create the program, new changes in their organization’s landscape may begin to emerge. Or, as one of my clients experienced, a startup competitor can emerge virtually overnight—requiring dramatic changes in their customer care approach and response times. Their eLearning solution, still in development, was completely out-of-date before it was launched. Organizations won’t be able to evolve their learning offerings if they continue to work with the “push” approach to learning and development, where centralized L&D teams determine what, when and how learning is delivered. Instead, L&D needs to adopt a “pull” approach—creating the culture and conditions that enable teams to pull in learning content that fits the context of their work. For many L&D teams, providing the right amount and range of content has been their primary focus. Given the length of time it can take to source and implement new training offerings, many teams have moved on to source the information themselves (via online programs, MOOCs, etc.). Instead, L&D needs to focus on providing a learning environment, where teams can share and contribute new ideas, and take ownership of driving the learning content they need. The role of evolving L&D then becomes helping teams understand how to improve and integrate learning directly into their work by delivering a learning “ecosystem”: a network of processes, tools, and resources that help leaders and team connect to the information they need. Furthermore, they must be actively creating an organizational culture that allows individuals to share what they’re learning, experiment with new ideas, and process the information into true learning that is tested and integrated into their work activities. 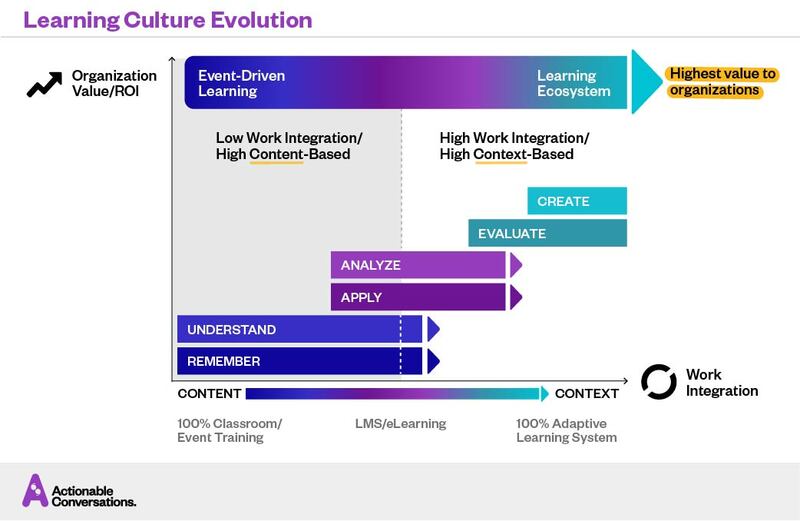 In our Learning Culture Evolution model above, we’ve mapped Bloom’s taxonomy against the evolution from content to context, realizing greater value to an organization the more closely integrated learning is to the work. The notion of “learn as you go” means you’re removing the delays in time for content to be developed into training, or having learners step away from their work to attend a training event. You’re further ensuring that the full value of learning can be achieved, because the benefits occur as the information is being consumed. You no longer run the risk that learning will be heard and forgotten, or that time will be wasted on learning events that are irrelevant. In some respects, the evolution along the top of the model can be a way to map the current mindset of your L&D and leadership clients as well. Where they land on the continuum of preference for certain types of learning will help you identify the opportunity for new offerings, as well as where you’ll have to convince them of the need for change. As Josh Bersin notes in the recent The Disruption of Digital Learning analysis, we need a new business model for learning, well beyond LMS and eLearning, where teams can take a stronger leadership role in owning and integrating learning into their work. These “adaptive learning systems” are in response to the need for personalization of learning content to help people sift through the massive amounts of information available today, and integrate the ideas that are most critical to their work. In the customer care training scenario mentioned earlier, imagine instead if a leader reads an article or hears about a new idea that would improve their team’s performance. Instead of hoping L&D has something similar, or waiting for it to be developed, the infrastructure exists to share the content, discuss how it applies to the team, and implement new solutions that allow them to test and course-correct over time. In her book Teaming, Harvard professor Amy Edmondson calls this a “collective learning experience”, where organizations embed ownership and implementation of learning directly into their teams, and individuals are able to share ideas, test, experiment, and gain insights that allow them to incorporate new ideas in parallel to delivering results. We know that this works, and learning can happen without individuals needing to step away from their work in order to learn. We receive ongoing feedback from users of our Conversations Platform that teams know better than anyone how to take new ideas and shape them into solutions that can be rapidly integrated to change their work. This isn’t about creating the next evolution of eLearning: even in the many iterations we’ve seen over the years, it continues to be a static offering that captures point-in-time information to serve out to the workforce. Adaptive systems take this packaged information and allow teams to discuss, redefine, and implement new solutions that leverage inputs in a variety of forms to meet their needs. And ideally, create an environment that allows them to share their findings and shifts, where changes are tracked at an organizational level in order to find common themes and trends. If the learning solutions you offer are only in-person, one-time delivery options, you might be hyperventilating at this point—particularly if you struggle with technology. It’s clear that continuing to offer only event-based “deliver and disappear” training is hugely insufficient as learning cultures evolve. What you offer needs to be running in parallel to the work teams are doing to solve the challenges they face every day. You need to think beyond classroom and LMS-integration, and look at how to play a leadership role in evolving learning for your clients. Helping your clients evolve their learning culture to create the conditions required for collective learning experiences that are integrated into the context of operations will give you a competitive advantage over those offering content-based solutions. This also presents an exciting opportunity for consultants, who can help by evolving L&D as a strategic player by providing solutions that better address the real needs of the organization. You can start by attaching behavior-reinforcing elements to your live programs (activities like mastermind group calls, or scheduled feedback loops) to check in with your participants after the training has occurred. Some consultants are suggesting choosing a buddy from the session for follow up and greater accountability. But the more that you can do to offer seamless solutions to extend the learning from your classroom into their work, the greater behavior change and measurable benefit participants will see. There’s no doubt that your clients are struggling to keep pace with the rapid shifts in the business landscape. Moving teams into a learning culture mindset—with learning embedded in the context of daily work for organizations and teams—offers the most effective way to tackle these challenges. The role of L&D must evolve in parallel, away from content focused solutions, and toward adaptive learning systems that are integrated into the context of work. Learning then becomes an integrated part of daily operations, and allows L&D to shift into a more strategic position within the organization. Furthermore, learning presents opportunities for consultants to reach deeper into their client organizations to create adaptive, agile, responsive cultures, that are prepared to thrive in the rapidly shifting landscape. That’s a win for everyone. Alyssa Burkus is Head of Content at Actionable.co, where she is responsible for creating learning content for the Actionable Conversations platform that helps teams and leaders build skills and engagement, as well as for Actionable’s series of websites. 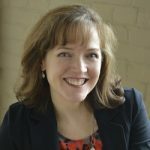 Alyssa is also Founder of Shift Wisdom, a change consulting firm in Toronto, Canada, and writes occasionally for other sites, including CIO.com and HR.com.